It’s the auctioneer’s job to get as high a price for an article possible. 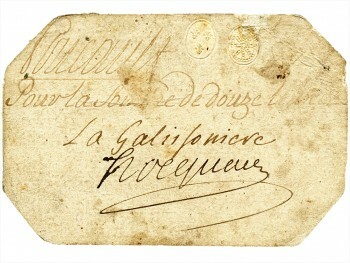 The next lot, #13, a 24 livres card dated 1730, was the largest and most impressive piece of card money in the auction. After spirited bidding, it sold, for $28,000. This was quite a difference from the previous lot, but no matter, we already have an example in the National Currency Collection. What caused me grief, however, was that the underbidder of lot #13 became my competition for the next lot. The audience clapped in appreciation. I sat still and waited for the next lot. This, though, was the only defeat I suffered. 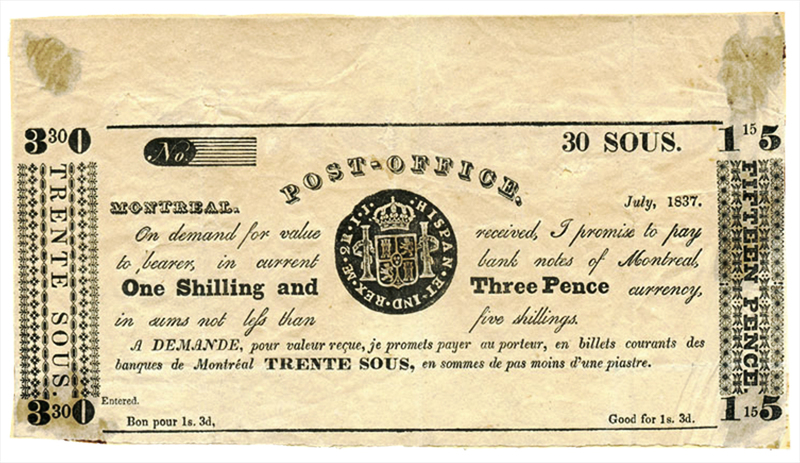 Over the next 15 or so minutes I spent in excess of $20,000—purchasing four unique pieces of early Canadian paper money. 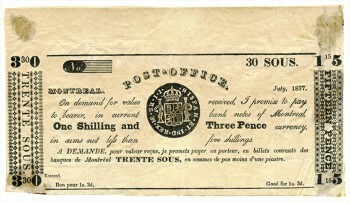 My purchases for the day included three rare pieces of French regime paper money and one unique piece of scrip issued by the Montréal post office. 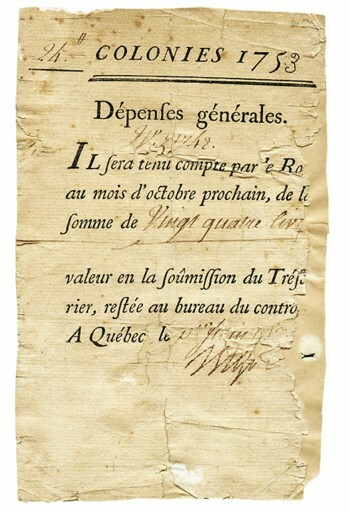 The French regime notes rarely appear on the market and are among Canada’s earliest paper money. 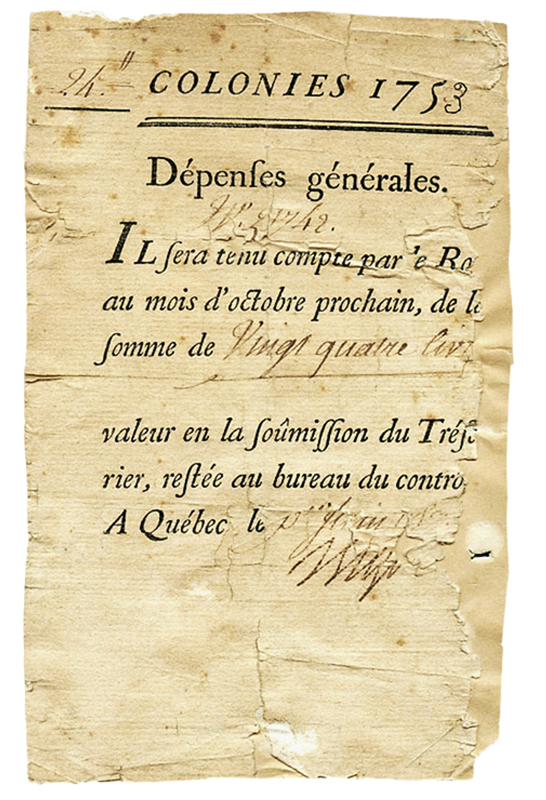 The card for 12 livres was part of a series initiated in 1683 when the colonial government lacked sufficient funds to pay their troops. The two later instruments, dated 1753 and 1759, respectively, are called billets d’ordonnance and were distributed during the ongoing wars between England and France. 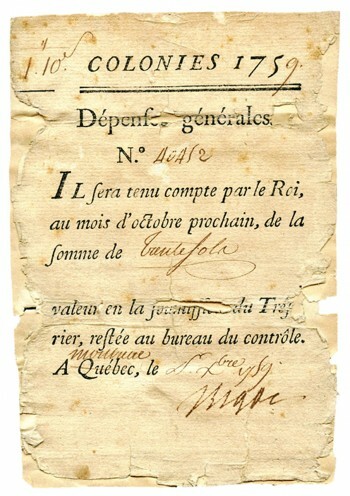 The large numbers issued and subsequently left unredeemed after 1760 led to a general mistrust of paper money in Canada that lasted until the 19th century. The 15 pence note from the post office is only the second known to exist. The other, for 6 pence, is in the National Currency Collection. 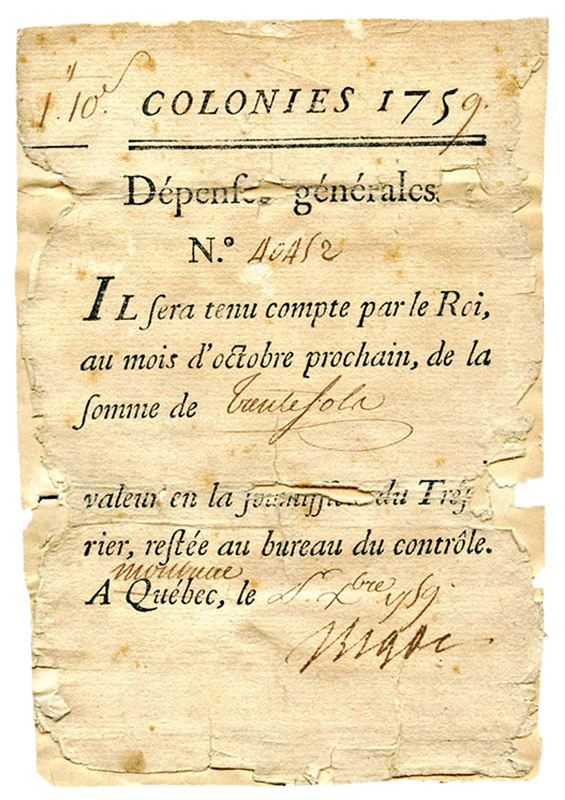 These notes were issued during the financial crisis of 1837 when the banks in Lower Canada ceased redeeming their notes in gold or silver. 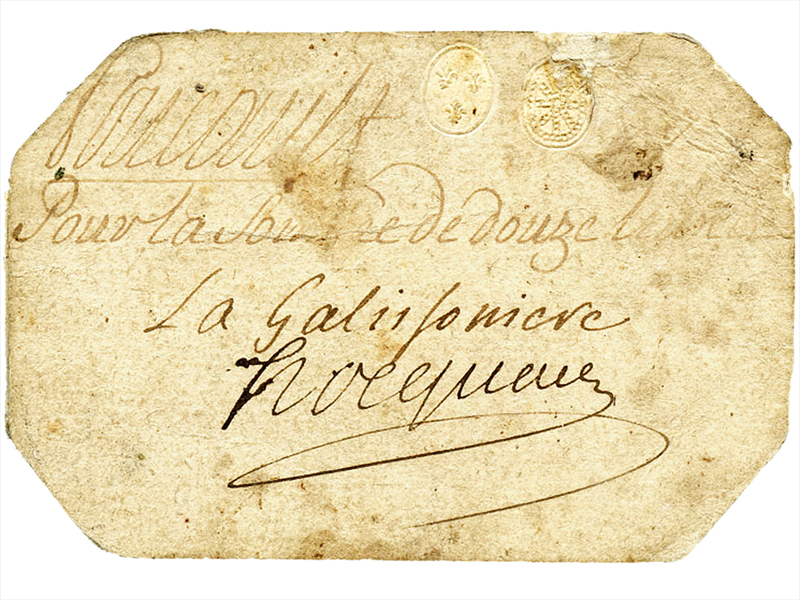 People hoarded coinage, and merchants were forced to issue bons, or private paper notes, to conduct business. Having finished bidding and eager to return to Ottawa to spend time with my family, I hurried out of the sale room. On Saturday afternoon the bus leaves Montréal for Ottawa every hour on the hour. By the time I reached the wicket the attendant would only sell me a ticket for the 3 o’clock bus. I took it and headed for Gate 18, arriving just in time to see the 2 o’clock bus backing out of the bay. Over the next hour I read, rested and was accosted by a man who offered to sell me his jacket for $70 to buy a ticket. A one-way ticket to Ottawa costs $40. In any event, I finally boarded the bus, arrived at the Ottawa station before 6:00 and caught a cab home. Saturday, 14 May 2016 was no longer than any other day, but it felt as if I had accomplished more than usual. I had travelled over 250 miles, visited one of Canada’s great cities and spent loads of money (thankfully not my own) on four excessively rare notes that now can be shared with all Canadians. All in all not a bad day! What’s on for tomorrow?